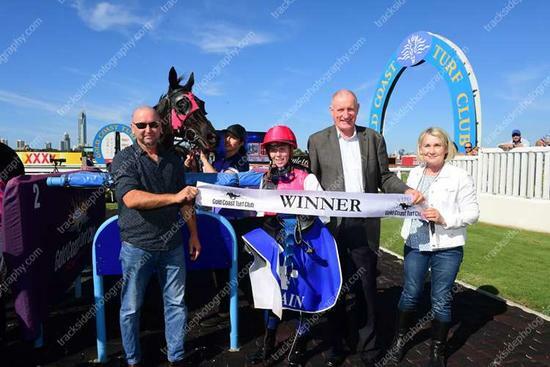 Promising filly Vol Vallee took the float down the Bruce Highway to the Gold Coast last sunday to tackle a Fillies and Mares Handicap over 900m. Jumping from barrier 6, the filly missed the kick by at least two lengths. Leading apprentice Tiffani Brooker dug the heels in and mustered some speed to land midfield upon settling. Approaching the turn, Brooker eased Vol Vallee out 5 wide to issue a challenge and she let down beautifully to take the lead and win by half a length! This was a very tough win for a filly going places with nothing going her way. She was very strong to the line and going forward she should get a bit further in some better races. Congratulations to the owners on her first win!